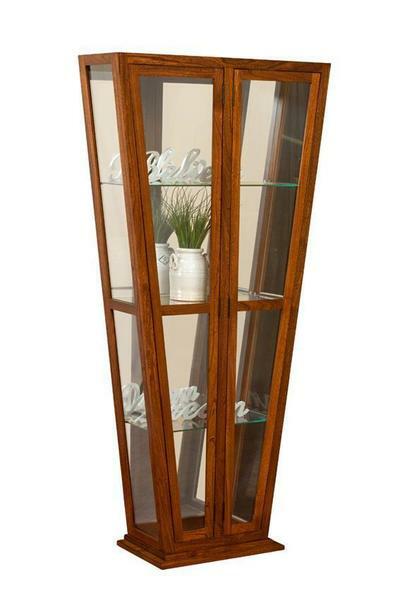 Our Melody Amish Contemporary Curio Cabinet features a unique tapered design that will call attention to your mementos, memorabilia, collectibles and heirlooms. Framed by a solid wood frame custom-made in your choice of wood type and finish from a variety of options, this curio cabinet features glass on three sides, a mirrored back, push and release glass doors, adjustable glass shelves, and touch LED lighting to fully display the beauty of some of your most cherished items. Please call to order curio cabinet with keyhole lock option. This lock option is not available with all hardware options.